Before I came to City, University of London, I was in college studying Biology, Chemistry, Mathematics and Economics. I also had a part-time job at the local opticians. I decided to apply to study at City due to the convenience of travel from my house. City is in the heart of London and there are numerous train and tube stations (Angel, Farringdon and Barbican) which surround the University and make it easily accessible. City also has excellent Optometry facilities e.g. CitySight, City's optometry clinic, which has excellent up-to-date equipment and well-renowned practitioners who support us during the course. My favourite thing about studying at City is the multiculturalism. This University has students from various backgrounds, including many international students. This means we can form more societies and get involved in more activities within the Students’ Union. 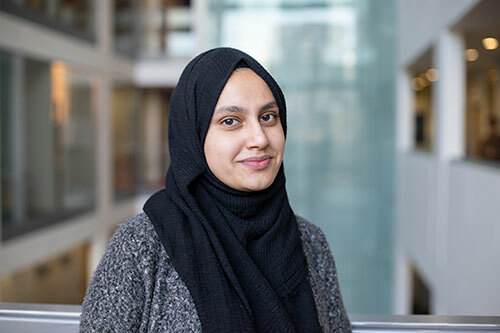 I am part of the Marketing Student Ambassador Scheme, which allows me to represent the University in my free time as well as getting paid. This fits very well around my timetable and has allowed me to meet lots of new people and learn new and exciting things about the University. After I graduate, I hope to complete a master's degree in Optometry, which will open up many more doors for me such as working in hospitals and studying abroad. I would also like to volunteer abroad with organisations such as Vision Aid Overseas, where optometrists go to third world countries and help people who suffer from any eye diseases. Work hard on achieving your grades in your current college or sixth form. This will put you in a good position to get an offer and secure a place studying Optometry. Focus on your personal statement, any extracurricular activities that you do and part-time jobs. Make sure you write it down and try to make your personal statement stand out.